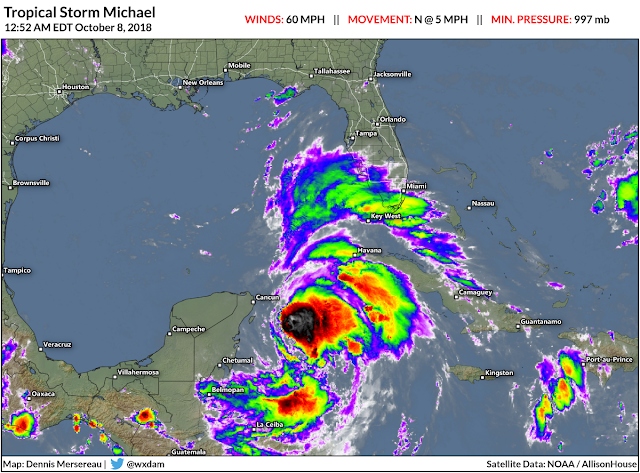 Tropical Storm Michael will likely become a hurricane in the Gulf of Mexico on Monday as it gradually accelerates toward the northern Gulf Coast. The storm will likely make landfall on Wednesday somewhere on the Florida Panhandle. Michael will move through quickly, but its strong winds and heavy rain could cause problems from the point of landfall in Florida northward through the Carolinas, still reeling from Florence. The National Hurricane Center found Michael strengthening quickly on Sunday. It got its act together in a hurry, going from a disheveled tropical depression on Sunday morning to a 60 MPH tropical storm by nightfall. 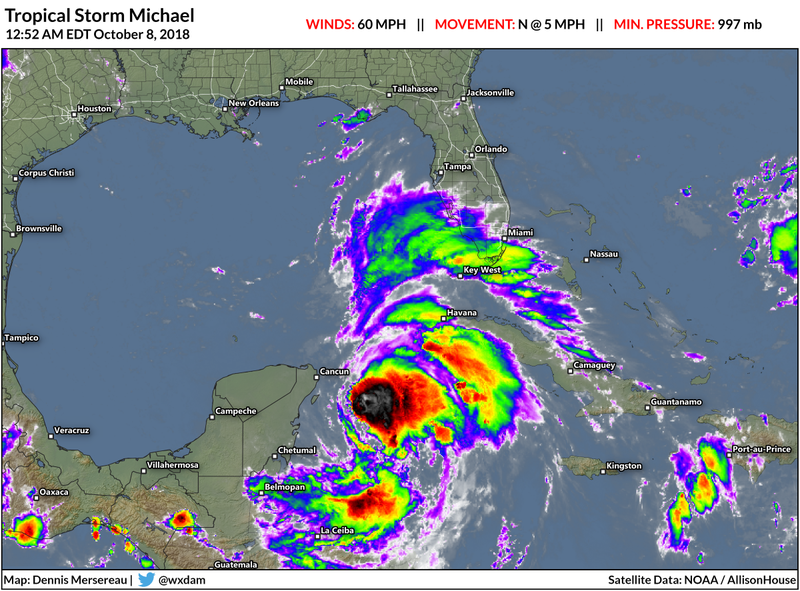 Michael is in a favorable environment for strengthening, and the current NHC forecast shows it doing just that between now and landfall on Wednesday evening. The storm's maximum winds could approach major hurricane strength as it nears land. 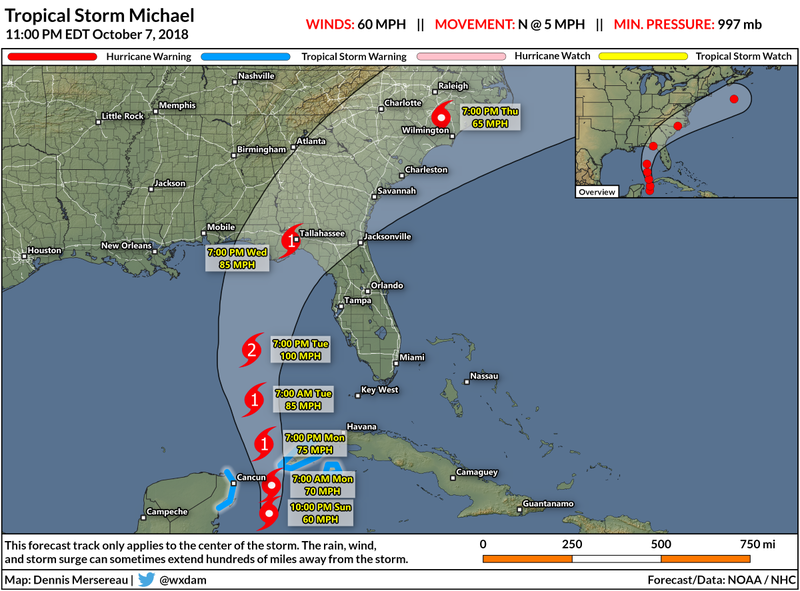 Michael could make landfall anywhere between Pensacola and Florida's Big Bend. The most likely area is in the central Florida Panhandle around Tallahassee, but the the precise forecast track will change as the experts get better data and the storm roots itself more firmly in the environment. Wind damage and power outages are likely around the point of landfall and for dozens—possibly hundreds—of miles inland. The current NHC forecast shows Michael still packing sustained winds of 65 MPH when it reaches eastern North Carolina on Thursday. While the storm is likely to weaken once it's over land, the potential exists for widespread wind damage along the path of the storm as it moves through the southeast. A storm surge of several feet above ground level is likely where Michael makes landfall, especially to the east of the eye. The NHC will release more precise storm surge forecasts once watches and warnings are issued on Monday. Florida's Big Bend is exceptionally prone to storm surge. Even a weak storm hitting this part of the coast can cause significant inundation in some coastal areas. Thankfully, much of the area prone to the worst surge is unpopulated, but there are many populated areas and vacation destinations that could be affected by storm surge flooding. 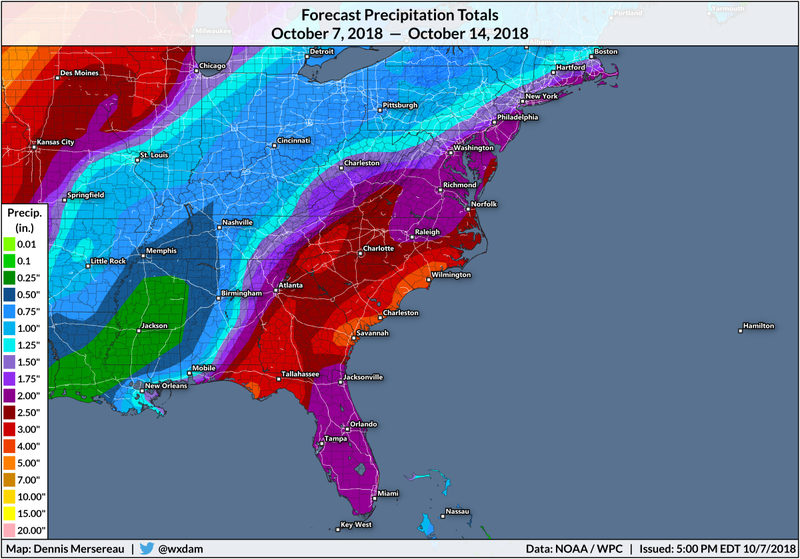 The storm's swift forward motion should preclude an extreme rainfall event along its path, but the Weather Prediction Center still expects at least a couple of inches of rain along Michael's path through the southeast. Some areas could see higher totals where bands of showers and thunderstorms repeatedly move over the same spots. The ground is still water-logged in parts of the Carolinas that saw as much as three feet of rain from Hurricane Florence last month. It won't take much to trigger flash flooding in these areas. Tornadoes are possible along the eastern part of the storm. The most likely areas to see tornadoes on Wednesday and Thursday are the eastern parts of Florida, Georgia, South Carolina, and North Carolina. Tornadoes associated with tropical cyclones can occur quickly, reducing tornado warning lead time. While these tornadoes are usually small and relatively weak, even the weakest tornado can cause life-threatening damage to buildings and vehicles. A hurricane watch is likely for much of the Florida Panhandle on Monday. This storm is moving quickly and you don't have as much time to prepare as North Carolina did for Florence. Make sure you have the supplies to make it through a power outage and your property is properly secured from blowing debris or fallen trees.